Genuine, all natural lightning sand fulgurites from Florida matching our pendant by the same name. The magnificent power of lightning creates these stunning hollow tubes, referred to as "fossilized lightning. Bolts of lightning leave their fossilized tracks in the sand, creating hollow tubes and fulgurite fractal "dendritic trees" that are glass lined. They are beautiful and they make wonderful, very unique jewelry! 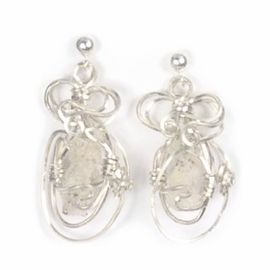 Approximate size of earrings: 1 3/4" L X 5/8" W X 1/4" D; Fulgurite size in setting is 7/8" L.
These authentic fulgurite lightning sand drop earrings are a matching pair, small and elegant. These professionally wire wrapped fulgurites, in sterling silver, are skillfully designed to make ideal gifts with a romantic and distinctive flare. This is the real stuff of Hollywood legends and movies like Sweet Home, Alabama and a few others! Only a very few fulgurites are precise enough in size to be used as earrings. The quality is hard to find and the skill to wire wrap them is advanced. The Lore and Folk History of Lightning Sand: Promotes Good Luck, Success, Enthusiasm, Insight, Serendipity and Creativity. Wire wrapped in open cosmic design. Ships with a Certificate of Authenticity, quality black velvet jewelry box and information about fulgurite lightning sand! Both earrings are similar size in length and appearance, yet naturally different. Suitable for pierced ears. FREE PRIORITY SHIPPING (2-3 days) IN THE USA!